At Dynomite Detailing we provide oil spraying & permanent rust proofing for new and used vehicles as well as complete shampooing and detailing, polishing and waxing on cars, trucks, boats and RV’s and trailers. We also specialize in removal of industrial fallout from over-spray. Our detailing process includes an extremely thorough cleaning, polishing and waxing of your automobile, both inside and out, to produce a show-quality level of detail. Besides improving appearance, detailing helps to preserve the resale value of a car. We’re a small business which allows us to maintain a very personal customer rapport and approach. We custom tailor packages to suit each customers needs. We also offer detailing of your Motorcycle, Tri-Wheeler and Quads, too! Having a genuine customer relationship enables us to have a strong repeat customer base as well as promoting our business via satisfied customer testimonials and word of mouth. 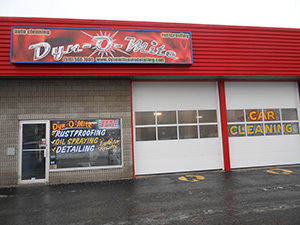 Please call us at 519-568-7800 today or stop by our NEW Victoria Street North location to see what Dyn-O-Mite Detailing can do for you!